Each day, millions of internet users view ads on Advertising Network sites. Data collection on users and pages. A substantial portion of the ads on YAN sites are contextual ads that are displayed to users based on their particular interests and web page content. 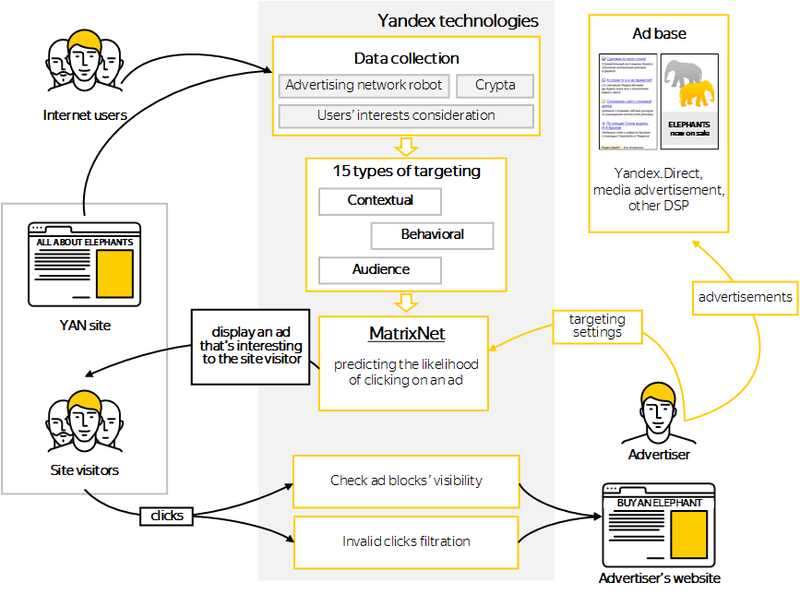 The individual interests of users are determined by their behavior when using Yandex services or their behavior on partner sites of the Advertising Network. The technology is responsible for classifying socio-demographic groups. Various user interests are accounted for when displaying behavioral advertisements. A page's theme is determined by the YAN robot that regularly crawls the pages of sites on the Advertising Network. Effective targeting system. We employ 15 types of targeting when selecting ads to serve. Among them, 8 use behavioral targeting (including autoretargeting for all clients that use Yandex.Metrica), 6 use contextual targeting, and the remaining one uses learning-based targeting, which adapts to the interests of the users of several ad platforms and regions and is capable of predicting their changes in the future (for example, during holidays or during another peak season). Owing to all the above targeting, suitable ads are selected for each user on each specific page. Predicting click probability. Ads are automatically selected for impressions on the Advertising Network according to the maximum expected revenue. The machine-learning system MatrixNet is used to forecast click probability. It takes into account more than 120 ranking factors, which means that we select the ads that are most interesting to users and most profitable to our partners. Testing ad block visibility. Advertising Network statistics only count ad impressions that actually allowed a user to have contact with the ad. In other words, for an ad impression to be counted, the ad block must be at least partially in the user's field of view, and the contact time must be sufficient for the user to actually see the ad. Data on ad block visibility is provided in the YAN interface. Filtering invalid clicks. To protect from fraudulent or erroneous clicks, we use a multi-stage technology that includes automatic as well as manual filtering methods. This means that our ad network enjoys the well-deserved trust of advertisers. Click the elements in the diagram to go to the corresponding Help section.